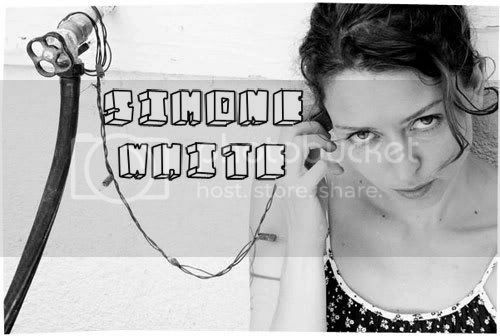 Singer/songwriter Simone White is one interesting character to look at. Born in Hawaii to a folk-singer (mom) and an artist (dad), plus a grandmother who use to be a singer/showgirl/dancer; you can pretty much visualize the life surrounding her adolescent days. White has been involved in all kinds of art-related field possible, be it acting, photographing, writing, and now singing. Have lived in London for quite awhile, made little movies by herself, while also photographing bands quite a bit where then she moved to New York, picked up a guitar and that pretty much brings us up-to-date. It’s interesting to find that she’s been dabbling in various creative spheres before she settled down in singing; she’s probably a singer that’s able to see music from different perspectives and angles, thus making her a lot more certain of how she wants her music to come off as. ‘The Beep Beep Song’ is a really simple and short tune, enveloped by Simone White’s warm, subtle yet clear vocals. The song is dense with a calming atmosphere and flowing melodies that slowly captures the quaintness of the tune. However at the same time it feels so tiny and dainty, you almost feel like you can cup it your own hands. All in all, it’s a very neat and pretty song, that’s set to warm your heart on any given day or night. Apparently, Audi has been using the track for their commercial in conjunction with their latest model that’s just come out, plus a tagline that goes, ‘The slowest car we’ve ever built’. Hmmm…, intriguing. How slow is slow?